Wisconsin Justice Initiative seeks audio tapes to see if court is following the laws on handling defendants. The Municipal Court, at 951 N. James Lovell St., makes a profit every year, according to the city’s budget office. Photo by Sue Vliet. The Milwaukee Municipal Court has denied a request for five months of audiotapes from a court watchdog organization, stating that it would need to delete personal information such as addresses of city employees and separate confidential juvenile information, which would create an unreasonable burden. Wisconsin Justice Initiative is seeking the audiotapes to determine whether the court is meeting its legal obligation to provide attorneys to defendants facing jail, and to determine if the court’s three judges are conducting legally required hearings to determine if defendants can afford their fines, the organization said in a statement. 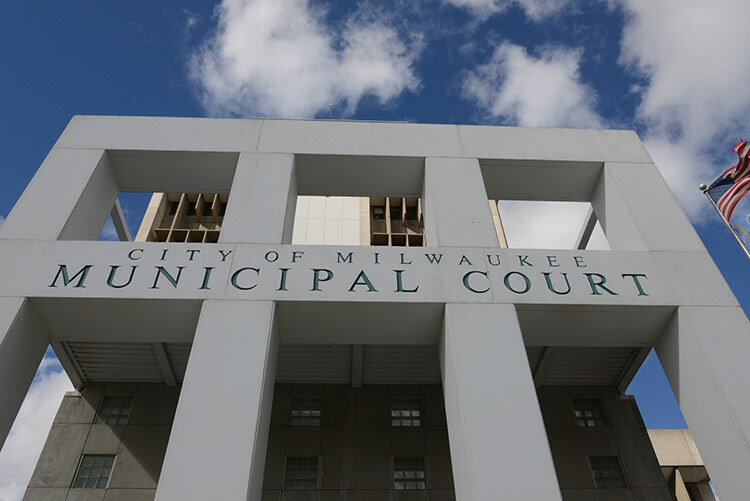 The Milwaukee Municipal Court’s handling of open records came under scrutiny last year when the Milwaukee Neighborhood New Service published a story examining the difficulty of obtaining court documents on cases. Wisconsin Justice Initiative requested five months of audiotapes of court proceedings from the Milwaukee Municipal Court on June 7. Not all proceedings are taped, but state law requires electronic recording of every proceeding in which testimony is taken under oath in a municipal court, the organization said. On July 1, assistant court administrator Jane E.T. Islo denied the request in a letter. She wrote in her response that the court would have to review 120 recordings of trials and other hearings, many of which involve multiple hours of audio, in order not to disclose information that is not subject to the public records. “We believe your request, without a specified subject matter, is excessive. Compliance would so burden the court that its normal functions would be severely impaired,” Islo said. “Although your request is currently being denied, the Court is still willing to work with you to get you the records in which you are most interested,” she added. Islo wrote that audiotapes may contain testimony in which city employees such as police officers or Department of Neighborhood Services inspectors disclose personal information that is exempt from the state open records law. Schuldt said the court has displayed “truly bizarre reasoning” in denying the request, noting that circuit and appeals courts and the Wisconsin Supreme Court would need to go through every court record and delete the home address of every defendant who may be a public employee. “That just doesn’t happen,” she said. Islo also wrote court cases involving juveniles who are younger than 17 years old are not subject to the open records law. Schuldt said, however, state law already requires separation of juvenile records from adult records. Schuldt said her organization is willing to break up its records request into multiple parts and accept responses in stages. Contact the corporation counsel for help with violations of the public records act. The court cannot deny records on the excuse it will take up too much time any more than it can refuse a trial because it will take up their time. It is the duty of the court to make records public. That IS its work. Actually, requests can be denied for being burdensome, per Schopper v. Gehring. According to Schopper a records request should no “so burden the records custodian that the normal funcitoning of the office would be severely impaired.” I’d say having to have someone review 120 hours of tape to identify necessary redactions is burdensome – that’s three weeks of working full time. For one request. In an already busy court. So what court services should be put off for three weeks to work on this one request?? And the statutes do, indeed, prohibit an authority from releasing employees’ home addresses. Wis. Stat. 19.36(10)(d). The court is justified in its decision.